Alphabets for needlepoint come in a variety of styles, from elegant formal classic lettering to traditional and contemporary patterns to quirky and outrageous letters formed from pictures and colorful designs. These patterns and designs are used to personalize needlepoint projects by working initials and fancy monograms as well as letters and numbers that spell out a slogan or message. Needlepoint letters and numbers, regardless of style, should always be worked in the continental tent stitch. This stitch keeps the canvas mesh threads from shifting as you work other techniques in between and around the alphabets. As much as possible, avoid creating uneven thicknesses on the back of the canvas when working letters with design elements that jump across extensive background areas. Although you may have to skip across a few mesh threads here and there to stitch a single letter or number, do not jump from one character to the next. End and clip the thread, and then start fresh with the next letter. Ideally, alphabets and numbers should be graphed for square needlepoint canvas to make them easy to stitch. Letters and figures that have curves must be worked on larger sections of needlepoint canvas to get a rounded appearance. Leave enough space between letters and numbers to display them attractively within the needlepoint design area. For phrases or sentences, the amount of spacing between letters should be twice as much as for single alphabets and monograms. One of the most personal things you can to make a needlepoint item unique is to customize it with a stitched monogram or favorite saying. Here are foolproof steps you can take to make perfect needlepoint letters and numbers every time you use them! Choose an alphabet style and size that fits your needlepoint project. The easiest way to do this is to count both the horizontal and vertical canvas mesh threads in the area where you will place the monogram. Compare this figure to the number of stitches wide and high in your chosen alphabet design, allowing for extra space between letters and words. Use this information to select the perfect alphabet pattern. Plan out the letters or numbers you want to use on plain graph paper before stitching. Make sure the graph paper is the same size as the canvas mesh. For example, if you are working on #12 mesh needlepoint canvas, you should use 12-squares-per-inch graph paper to chart the stitches. Mark the number of threads you will need to form each letter by coloring in the appropriate squares on the graph paper. Each colored square represents one continental stitch worked over one vertical and horizontal canvas mesh intersection. Place the blank area of the canvas where the lettering will be placed over the graphed alphabet. Step back to check how the lettering looks and if it fits well with the right spacing. Make any adjustments to the alphabet pattern or choose another design that has a better look and fit. Find the center of the letter as well as the area where it will be placed on the canvas. Divide the height and width of the alphabet as well as the canvas (see Step 1) in half. If you are planning to work a three-letter monogram or multi-word phrase, count the height and total width of the letters and words as well as the spaces in between them and divide in half. The resulting number will be the midpoint stitch. Work from the midpoint stitch out toward either side. Follow the graphed lettering to completely stitch each letter before moving to the next one. 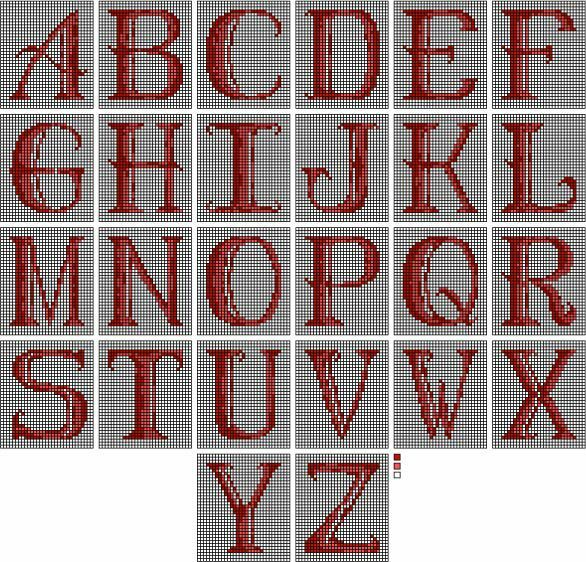 Download, save and print a copy of the Classic Alphabet Needlepoint Collection image above and use it as a guide when working projects that would be enhanced by an elegant needlepoint monogram.